Oct 26 1895 - Marion County, West Virginia..
4. John - b. 1827, mar. 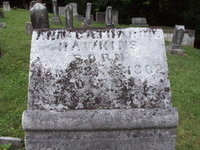 MaryParker .. died at Grafton W.Va. in Civil War. was poisoned while on a troop train.